It's not often that I receive a hardback book to review. 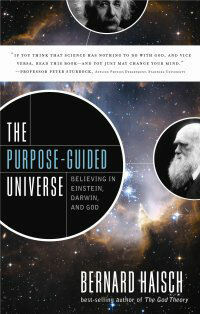 "The Purpose-Guided Universe" is a beautifully presented tome that is relatively concise at just over 200 pages of text. Although I have not had the pleasure of reading Bernard Haisch's book "The God Theory", this new book appears to be something of a sequel to that best-seller. I can see why his books are popular - he writes very well, and adroitly covers some mind-blowing concepts in modern science, with apparent ease. His style is authoritative, but not arrogant. In essence, he comes across as being the perfect science teacher - an accolade for which he is suitably qualified. The book's scientific slant is balanced by a terrific spirituality, too. This is profoundly important, I think, because the notion behind the book is that the universe has intelligent purpose behind it. That, of course, is not in itself a spectacularly controversial statement. But coming from a scientist it might court some eyebrow-raising, particularly among the vociferous atheists of science whose books sell in the millions, like Richard Dawkins. Bernard Haisch, himself an astrophysicist, offers a gentler vision of the universe where an impersonal God lies behind Creation, setting up the rules by which the universe is run. The fine-tuning of these rules appears to provide a perfect environment for complexity and life to flourish, and Haisch argues that this is no mere coincidence. The Universe could easily be a very different, and deader place. Much too easily, Haisch argues. The laws underpinning the fabric of the Universe are fine-tuned to create complexity to a degree that is phenomenally statistically improbable. This is a conundrum for scientists, and leads to a number of solutions. Either there are many, many (many!) universes of which we happen to live in the preferentially organised one, or the Universe has been created in a conscious, guided manner. The book looks at the scientific insights that suggest an intelligent origin to the universe - in particular various problems that have arisen out of quantum mechanics that have profoundly altered the modern scientific understanding of what the universe actually is. One phrase stands out in the book to sum this up: "Consciousness creates reality." The proof of this lies in the science, and, to his credit, Haisch presents this remarkable insight in as humble and matter-of-fact a way as one could conceivably manage. I particularly enjoyed the science presented in the book. The repercussions of the Leggett Inequality are far-reaching, and his eloquent portrayal of this complex aspect of quantum mechanics is masterful. One is struck by the weirdness of the quantum world. Many modern physicists look to String Theory, and the multi-dimensional models offered therein, as the answer to many of the perplexing questions of quantum mechanics. But Haisch is not so sure. He thinks that modern, reductionist physics has reached something of a dead-end, and that the new work carried out in recent decades has been far too theoretical, and disappointingly devoid of experimentation. He sees biological science as the way ahead - potentially offering new insights into how consciousness works and shapes our reality. This is an immensely optimistic work, and will appeal to "cultural creatives" everywhere. As an agnostic, I found the book very enjoyable as well as intellectually stimulating, and can think of a couple of my friends who would really enjoy reading it too. Subtitled "Believing in Einstein, Darwin and God"